Howard Cohen is a semi-retired Vitreo-Retinal specialist. He is a retired Army Colonel and former Green Beret. Dr. Cohen served in Vietnam from 1967-68. His books are based on his Vietnam War experiences and inspired by true stories. They bring together the war and modern day Vietnam. Even after fifty years, for some the Vietnam War never ended. Action, adventure,love, redemption and unlikely protagonists. 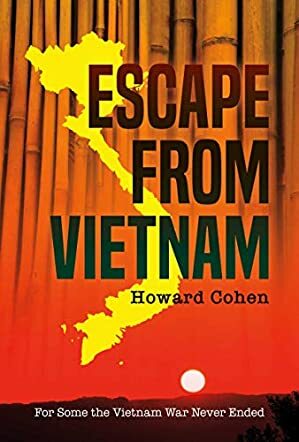 Reading a novel like Escape From Vietnam: For Some The Vietnam War Never Ended by Howard Cohen is so much more than enjoying an intricate, riveting plot and engaging with realistic and touching characters. It’s an opportunity for enlightenment, not just about the horrors experienced by both soldiers and those they tried to help during the Vietnam War, but about what it is like to live under Communist rule. And it is the last factor that propels the action in Escape From Vietnam and leaves readers grateful they don’t live there, even today. The key characters, a beautiful Vietnamese woman, Lan, and James, a Green Beret, became lovers during the Vietnam War. The war separates them, each eventually marrying someone in their own country. Now, in 2018, after years of non-communication between them, Lan tracks James down in North Carolina and asks for his help. James obliges, flies to Vietnam, and what he learns shocks him. Lan, and members of her family, desperately need James’ help to escape unscrupulous and cruel members of the powerful Communist Party. Aided by Lan’s trusted servants, James follow Lan’s plans that involve two separate escapes. The chances of success seem more unlikely with each turn of the page and readers are breathless, wondering what will happen next. It’s interesting that while Lan and James are the main characters, some of the minor characters, like Chang, are impossible to forget too. There are so many characters who touch you with their loyalty and strength, and others who make you shudder with their cruelty. The depictions of torture used to extract information make one cringe. Escape From Vietnam will engage readers' interest from start to finish. Recommended and unforgettable reading. James Britton, a retired psychiatrist living in Linville, North Carolina, was enjoying a relaxed, comfortable life. It changed overnight when he received a letter from an attorney, representing Nguyen Thi Lan. James and Lan were in a relationship in 1968, during his time in Vietnam, but they had not seen each other, or corresponded, since he left her town. James decided to respond to this request. He returned to Vietnam and his life was forever changed. He experienced the ongoing restrictions of the communist regime in Vietnam and how it was affecting the lives of Lan and her family, forcing an escape plan. Family members, who were engaged in pro-democracy activities, were targeted by the People's Public Security forces. These forces, at the direction of governmental officials, stopped at nothing to achieve their goals. The adventure centers around the family’s escape from their country. In Escape From Vietnam: For Some the Vietnam War Never Ended by Howard Cohen, the present day realities of life in this country continue to be horrific. This book details a story that is complicated and adventurous. The author has involved a number of characters with differing motivations and goals. He is able to illustrate two time periods, going back and forth with ease – 1968 and fifty years later, 2018. James and Lan, the two main characters, demonstrate the complex effects of this long-standing conflict; it did not end when the war ended. Author Howard Cohen has crafted a thought-provoking and gripping novel in Escape From Vietnam: For Some the Vietnam War Never Ended. Excellent story and plot. It is an unforgettable read. Escape From Vietnam: For Some the Vietnam War Never Ended by Howard Cohen plunges readers into a tense and dangerous political environment in Communist Vietnam. In the years following the war, the state shows no tolerance for anyone who would advocate for democracy. Nguyen Thi Lan happens to be one of the icons of change calling for democracy, hence pitting herself against a ruthless government. Now, she and her granddaughter are targets of the People's Public Security. With no way of escape, she turns to the one person she believes in, an American ex-lover who owes her a favor; James Britton. Can James help them in a situation so delicate, dangerous, and dire? Howard Cohen’s story is gritty, a tale that explores human resilience and resourcefulness in the face of grave threats and dangers. From the very beginning of the narrative, the reader is greeted with powerful yet graphic images that depict an atmosphere of war: “Wounded were everywhere. On beds, gurneys, stretchers, on the floor and still, they brought more. A cacophony of groans, screams, prayers, and curses filled the room. Blood pumping from arteries, flowing slowly from veins, warm, sticky, puddling on the rough cement floor.” The characters are well imagined and developed with substance; emotion fills every page of this narrative. Escape From Vietnam: For Some the Vietnam War Never Ended has an unusual plot and it is interesting that the protagonists so easily find themselves in very tight situations. Cohen explores the real face of Communism in this narrative and shows the very core of man’s inhumanity to man. Filled with historical references, this novel allows readers to revisit history and to have a strong feeling of what it felt like to want democracy in a Communist world.